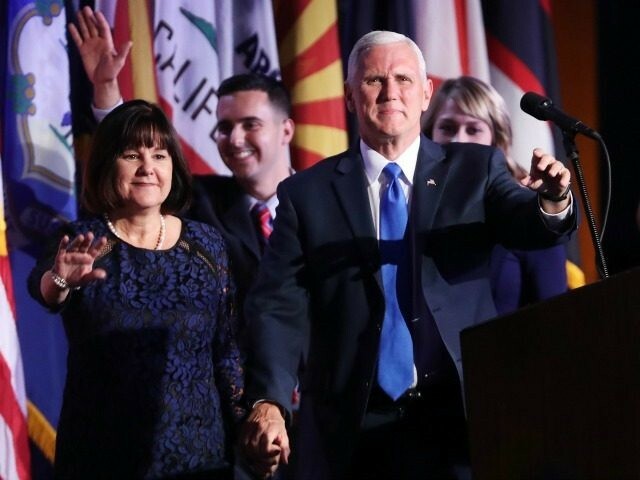 NEW YORK, New York — Vice President-Elect Mike Pence is thanking God for making Tuesday night’s victory for him and Donald Trump a reality. “This is a historic night. This is a historic time,” Pence said from the Trump-Pence Victory Party at the Hilton Hotel in Manhattan. “The American people have spoken and the American people have elected their new champion,” he told the crowd at approximately 2:43 a.m. on Wednesday morning. The media had just called the election in Donald Trump’s favor, delivering Hillary Clinton a major defeat with trump winning at least 274 Electoral College votes. Throughout New York City, Trump’s victory was celebrated. Trump’s face lit up the side of the Empire State Building. News headlines reflected the victory and defying of odds Trump had achieved to defeat the corrupt establishment that Hillary Clinton represented. America’s 45th President, Donald Trump, will be inaugurated on January 20, 2017.